No smell! -- No spotting! Temporary Spray Adhesive for Textiles. The web spray pattern means less mess and better coverage. Great for appliqué, quilting , sewing and various paper crafts. 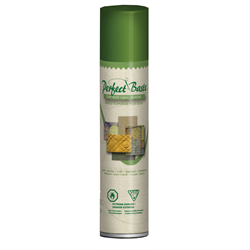 Spray on the back of batting, appliqué pieces, paper pieces, patterns, templates and more and place your project in the perfect location for a temporary hold. CFC free, Acid free, transparent.